Champagne is the star of Christmas and New Year’s Eve celebrations around the world. The tradition of bubbles and the association with hope and good times is so powerful that ita��s almost irresistible. Even if you dona��t fancy fizzy wines, this festive season is when most people make an exception. Champagne is produced only in the Champagne region of France and uses the costly bottle fermentation method. For those like me who incline towards real Champagne and find acidity attractive, therea��s enough good stuff available in the Champagne style. Whether Champagne or sparkling, these wines are very versatile and can be enjoyed right through the meal. Here is my choice of domestic and affordable sparkling wines to get 2016 on to a good start. Chandon Brut and Chandon Brut RosA� are world class sparkling wines produced in India by the French Champagne group, MoA�t Hennessy, from grapes grown and vinified in Nashik. Made in the traditional Champagne method with a second fermenation in the bottle, Chandon Brut uses Chenin Blanc, Chardonnay and Pinot Noir grapes, while Chandon Brut RosA� is made from Shiraz and Pinot Noir. 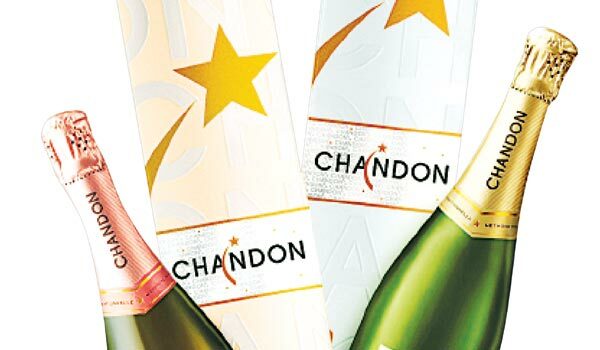 Chandon Brut has a soft palate of primary fruit characters and well balanced acidity. Vanilla and toasty notes add complexity leading to a lingering, crisp, dry finish. Chandon Brut RosA� is a rose-gold with a fine persistent effervescence. The palate evolves with mouth-filling small red fruits and creamy, citrus tones. `1,250 and `1,450 respectively. Brut Tropicale, released to mark Sula’s 15th Anniversary, is a limited edition sparkler that comes with a vibrant jazzy label wrapped all around the bottle. A Blanc de Noirs, the Tropicale is produced mainly from premium, estate-grown red grapes such as Pinot Noir and Shiraz.The wine tastes fresh and crisp despite its level of residual sugar. Slightly pink, with good structure from red skin contact with the juice, Sulaa��s Brut Tropicale will please across the board and the young set most of all. `1,050. Celebrated winemaker Piero Masi has helped produce a completely dry, Gran CuvA�e. (Gran CuvA�e indicates that it is made with specially selected grapes from the best parcel of land.) This is the only a�?zero dosagea�� sparkling by a domestic wine brand and is produced from 100 per cent Chenin Blanc grapes. With its bready, yeasty notes and mineral undertones, it is for the more serious wine lover. It is slightly citrusy in flavour with a creamy texture and clean finish. The Fratelli Gran CuvA�e is international in style. An elegant wine, made in the traditional Champagne method in Akluj. `1,120 in New Delhi. They have been winning numerous awards of late, including a Decanter bronze medal for the Zampa Soiree Brut. Pale gold in colour with a persistent mousse, it has a nose of floral, fresh lemon aromas and white fruit flavours such as pears. Attractively priced at `1,100, it is light and creamy, with crisp acidity and a dry finish in classic brut style. The SoirA�e rosA� costs a little more at `1,200 in Karnataka. are approximate, especially for the imported wines due to state excise etc.